Sir Richard Branson's Virgin Voyages is sure to be an interesting cruise line when they start sailing in 2020. The adult-only line focusing on unique experiences and a different take on cruising revealed more about what guests can soon expect, including how they'll help keep "sailors" (their term for guests) and the environment healthy. They also took this opportunity to name their first vessel. 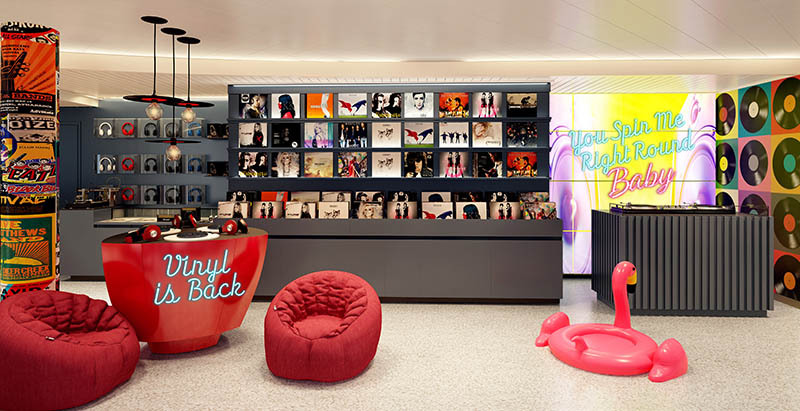 In a tribute to the Virgin brand's airline, Richard Branson revealed that the first Virgin Voyages ship will be named Scarlet Lady -- a name emblazoned on one of the first aircraft in the Virgin Atlantic fleet. The Scarlet Lady name will be paired with the brand’s iconic mermaid image across the hull when she first takes to sea in 2020. While announcing the name at the Fincantieri shipyard in Italy, the ship's dry-docks were flooded in preparation of joining the sections of the vessels, a milestone in the construction of modern ships. What's in a Name? Scarlet Squad. The ship name also pairs with the newly announced Scarlet Squad, a program aimed at recruiting, supporting, and mentoring female shipboard talent. The program will help grow opportunities and offer access to leadership roles in onboard areas such as marine, technical, and hotel management -- roles which statistically show low numbers of female leadership. Early on, we talked about Virgin Voyages being an 18+ cruise line, but there is something else you won't find on Virgin Voyages' vessels: single-use plastics. In recent months various cruise lines have announced that they're eliminating the use of straws in all drinks (unless specifically requested). On Scarlet Lady and other ships in their fleet, you won't find water bottles, cups, straws, or any other single-use plastics for guest (err, sailor) use. To help, sailors will have complimentary access to filtered still and sparkling water at all bars and restaurants, plus specially designed Natura filtered water stations throughout the ship. Many take to the sea to do rejuvenate, and old Virgin Voyages this is highlighted in the "Vitamin Sea" ideology. 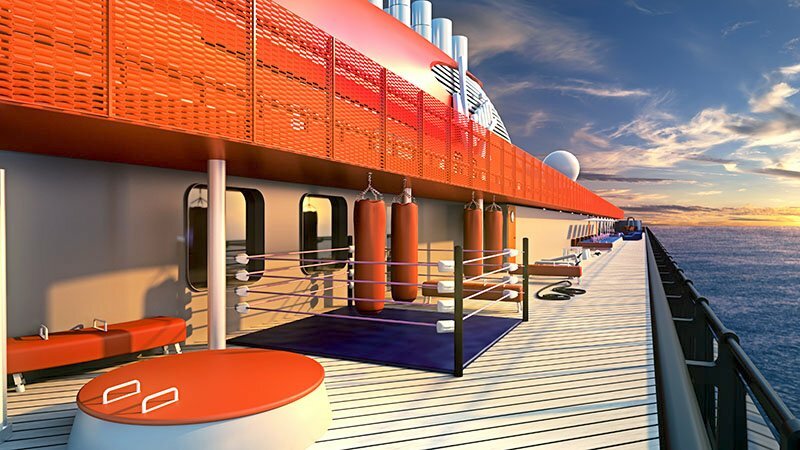 Available to sailors will be a wide variety of group fitness classes on board, all complimentary as well as high-activity options throughout the ship. Scarlet Lady has been designed with ample outdoor and outward looking spaces meant to be conducive to healthy activity. 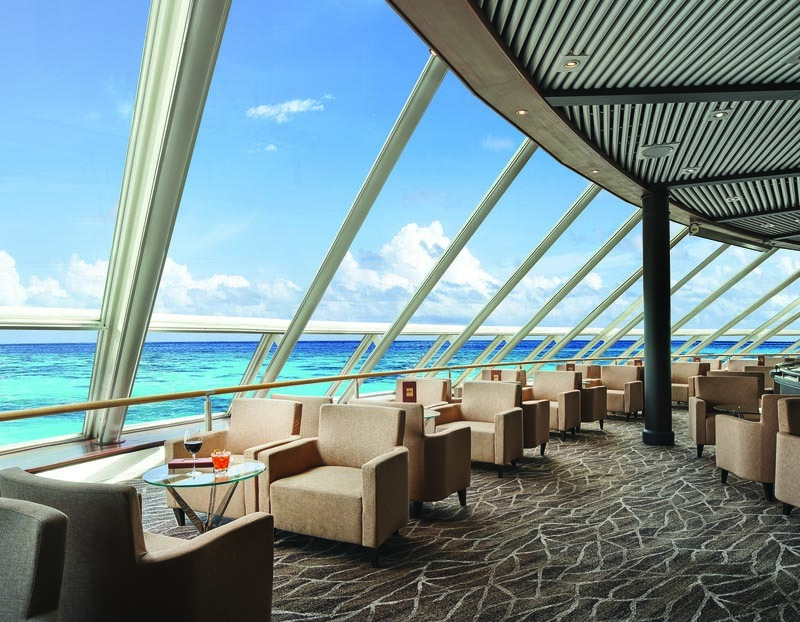 The Crow’s Nest offers 360-degree views from a secluded sundeck where guests can enjoy sunrise and sunset yoga. Nearby is the The Runway, a track that allows sailors to jog, walk, or even skate. Designed by Concrete Amsterdam, these areas connect to the Athletic Club. Offering featuring, among other things, an outdoor training zone, boxing ring, strength and gymnastics equipment, plus cabanas for relaxation, and a sporty bar for socializing post-workout, or observing those with more active holiday schedules. The B-Complex features strength, spin, yoga, and cardio in its Build, Burn, Bike, and Balance rooms, all with ocean views. The Burn and Build gyms will each be equipped with Technogym ARTIS, a line of sustainably crafted cutting-edge fitness technology. After work outs, sailors can enjoy the Well-being Pool and fresh cold-pressed juices, served at the Gym and Tonic bar. MyBeast, an artistic adult playground and fitness apparatus designed by Equilibria, aims to add a Venice Beach-like atmosphere to the Well-being Pool. The Redemption Spa on deck 5 is inspired by an underwater cave, billed as a "mermaid and merman hideaway" with hydrotherapy pool, mud room, salt room, cold plunge pools, quartz beds, and spa treatments. In the evening, DJs will turn the thermal spa area into a "mermaid hideaway extravaganza." 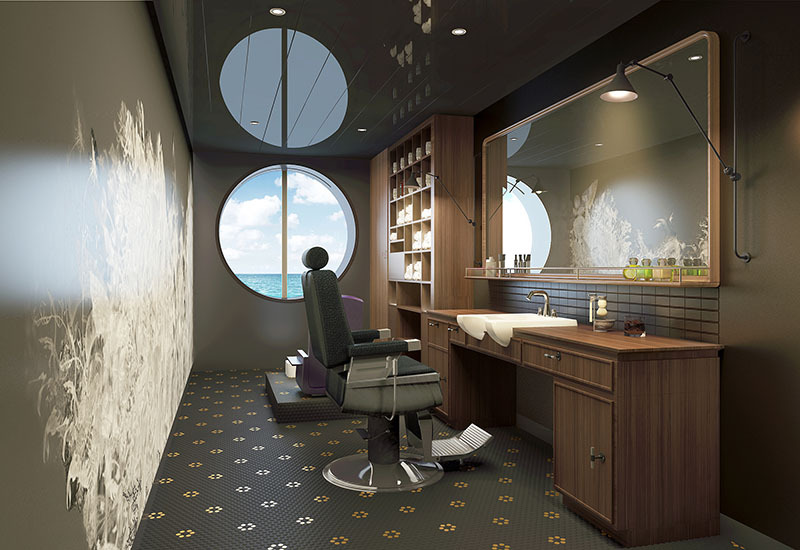 Guests can also take advantage of the Dry Dock salon or the Stubble & Groom barbershop with a male pedicure spa overlooking a porthole ocean view and to polish it off the gorgeous mani-pedi spa. 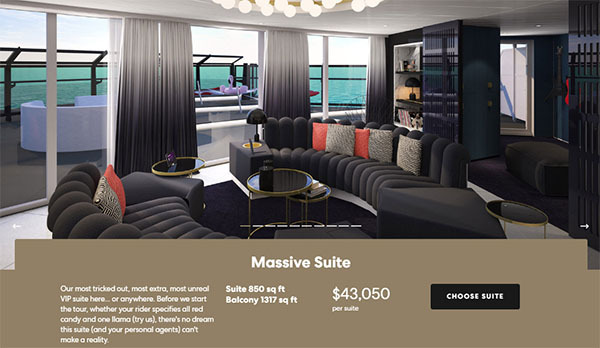 As we discussed when initial renderings came out, Virgin Voyages is clearly going for something different than the other lines -- but branding aside they're still very much cruise ships. That's okay, because these ships look fantastic, and with every rendering and description it seems more clear than they continue to craft experiences informed by what has worked for other lines, without being constrained to some of their paradigms. Also shaping up is the demographic that the line appears to be targeting. Young, affluent, health conscious -- groups that when combined, other lines have had some challenges getting onboard in the past. It's also good to see that Branson's tradition of enuring a diverse and satisfied workplace continues. While we've not written about it, we see locally (as they're based in South Florida), that some of the goals of Scarlet Squad are already being worked on at headquarters. All of this sounds great of course, but it's still difficult to really understand what the onboard feel will be like until they sail, and it will be at least another year and a half before we get to find out for ourselves. What stands out to you? Comment below, or reach out on Facebook or Twitter.